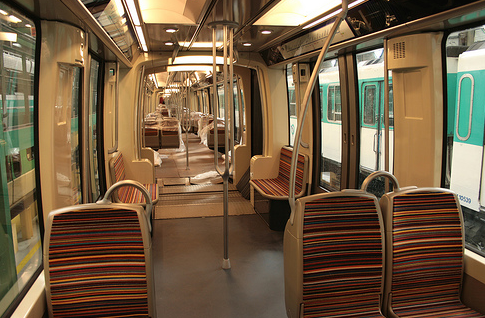 The open gangway of an articulated train in Paris. While visiting Montreal last year — a city on the same landmass as ours — I had the opportunity to enjoy a few subway rides on the city’s rubber-tired Metro. The trains had a special sound to it, generally quieter than the screech of New York’s subways, and the trainsets were a revelation as well. The concept of open gangways — articulated subway cars with no doors or gaps between cars — has filtered through the United States, but it is alive and well in Montreal, lending more capacity to a modest Metro. In New York City, where capacity problems are obvious every morning, every evening and every weekend, the MTA’s response has been halting and insufficient. As I wrote recently, the agency is ill prepared to deal with the crowds today and hasn’t adequate prepared for tomorrow. Even a fully funded 2015-2019 capital plan won’t do much to solve the subway’s capacity crunch, and although the first phase of the Second Ave. Subway is a start, by itself, it won’t be the answer. There are incremental solutions though, and open gangways are an easy one. London, in fact, has found that open gangways could increase train capacity by ten percent alone. The MTA hasn’t really dabbled with open gangways but has acknowledged their existence. The 2013 Twenty-Year Needs Assessment identified open gangways as a potential innovation on the horizon, and transit advocates noted that the MTA is one of the largest system in the world without such cars. Could this be yet another case of New York exceptionalism? It certainly seems so. Open gangways are hardly the end-all be-all of transit operations. They won’t guarantee better service or necessarily attract more riders. And they may not be able to resolve some issues, such as the fact that Washington’s Metro runs trains of different car lengths on each line. But the fact that every U.S. transit agency—with the exception of Honolulu’s—has failed to adopt to this trend and has no plans to change, raises important questions. Just how much are the management of these transit agencies isolating themselves from world best practice? This is hardly an isolated case. The fact that transit agencies around the world are transitioning infrequent suburban rail operations into frequent regional rail services seems to be lost on most U.S. commuter rail agencies. Freemark notes as well his own skepticism that “this technology is just ‘not possible’ on historic U.S. systems,” and his is a skepticism I share. That it has worked everywhere else is a clear sign that whatever barriers to implementation exist in the United States are those set up by our own agencies’ failures rather than by something unique to this country. For its part, the MTA has claimed developing a new subway car would cost too much in design spending, but as we reach a capacity crisis, what’s the alternative? If it takes 10 years and billions of dollars just to build a new subway stop, the next rolling stock purchases should all have open gangways. At this point, though, we won’t see such designs in New York City for at least ten years, if at all, and that’s just a failure of problem solving at a time when we need executives to be thinking outside the (American) box. Freemark notes as well his own skepticism that “this technology is just ‘not possible’ on historic U.S. systems,” and his is a skepticism I share. The BMT had articulated cars. In service for 40-ish years. For existing orders to be redesigned this is a valid excuse, but when you go to the drawing board for the next generation of cars, it doesn’t. All this really is is another classic case of unquestioning acceptance of the status quo. “We’ve always done it this way and that’s just how it is”. The “historic” nature of US systems is totally unsubstantiated, especially since much of New York’s system dates from the 30’s and DC Metro is all from the 60’s, while London is putting articulated trains on some of their oldest lines with the tightest tunnels and most limited loading gauges. It’s also not like we haven’t significantly redesigned the cars since then. WMATA and BART are in the middle of a large redesigns for their cars. BART more significantly (change the doors and the seating). Although in BART’s case, you’re allowed to walk through the cars to get to other ones. If not allowed, at least no one will stop you and people do it frequently. They probably should have taken the extra step to have open gangways. Getting a 10% capacity increase with no change to anything but rolling stock? That would seem like a no brainer. You’re not requiring a change to platforms or tunnels – only rolling stock purchases going forward. And since train sets are typically linked together in groupings, you can simply require that these linked train sets have open gangways. It would improve public safety, reduce the ability of idiots being able to get on top of the trains for their idiotic subway surfing), reduce chances of falling between cars while the train is in motion, all in addition to the increased capacity. The cons? Someone in NYC didn’t come up with the idea first before Europe has adopted the notion with gusto? It’s an idea that should be incorporated post-haste. having spent a year in both Montreal and Toronto, both subway systems have these ideas in place – in Toronto they actually have quite a few sets of a new bombardier train that are fully open end-to-end. Riding on it just felt right, and the crowding was quite minimal. It was of course, also nice to be able to move about the train freely. But of course the other reason “crowding” is “quite minimal” on the Toronto subway is that they run much more frequent service than the MTA does. 2 minutes between trains at the height of rush. Even at 11pm on a Sunday the trains run at under 7 minute headways. If the MTA were running Toronto’s subway they’d increase headways to create the crush levels we have in NYC. I have all faith that they’d be able to increase the headways to the point that the open gangway subway cars would be uncomfortably packed. They’re good at that! If, for instance (as a very radical proposition) the 5 and 3 service were to be axed (with an extension of the 4 to New Lots – requiring only 2 switches to be installed just east of Franklin Avenue, probably much cheaper than rebuilding the entire junction, and having to turn the Dyre Avenue line into a frequent shuttle – physically possible without any modifications to the track layout) the entire IRT main line could theoretically manage 32tph per 2 tracks (64tph per trunk line) as all conflicting moves have been removed from the system. (though it would require CBTC installation, which the IRT’s current signalling installation IIRC can handle). Likelihood of this happening? Really small. 2 stations would entirely lose service (which will be very unpopular), and all stations on the WPR will lose direct services to the East Side (which will also be unpopular, although less), and if someone wanted to go from Dyre to the East Side he/she would have to change 2 times. It may also require some work to 149-GC as a lot more people would be changing between the 2 and 4. But it may very well be the most cost effective option to increase service frequency on the IRT. There are some more possible examples throughout the system (southern BMT, though a rebuild of DeKalb with platforms on all lines would be desirable – never, never gonna happen due to cost, isolating the B/D from the A/C on 8th Avenue, removing the R from Queens Boulevard (which is something that may very well prove popular about 10 miles south in Bay Ridge – probably the only popular proposal), running the F train on the express tracks where the G runs (unpopular, because it’s the G train). Broadway will be impossible however, especially now that SAS is happening. Most of the subway system is (almost) physically capable of running as a number of self-contained high-frequency (I’m talking headways of 100 seconds) lines (if the split happened today CBTC installation would be a lot easier), and in the ideal world it would be the way forward. But almost nobody wants to lose their direct train to their destination (even with cross-platform interchange), so this is one of those ideas that, while operationally good, will never happen. I don’t know who you are, but you just read my mind. Interlining is an incredible waste of resources and should be minimized. -the detangling of Rogers Jct in Brooklyn is something I’ve been advocating. Sending 7 Av trains to Flatbush and Lex trains to Utica/New Lots would massively improve capacity along the whole IRT, although Flatbush terminal can’t handle many more trains than it currently does. About the Bronx side, I slightly disagree with your complete elimination of any merging – the Dyre line could simply be a branch of the main 7 Av service. That would severely overburden 149/CC with transferring passengers though, so a suitable compromise would be running a limited Dyre service (every ~8-9 mins) through to Lex, with an equivalent amount of 7 Av trains heading to Lenox. -CPW really needs to be desegregated if capacity should be increased. This is really trivial, and there are cross-platform transfers on both ends of the line. -The Culver express has been analyzed for ages, and as far as I know the conclusion is that at current F service levels, frequencies would be too low. Once tph is increased, Culver Express service almost becomes a requirement for service reliability. -32tph is too low as a maximum potential frequency. Moscow has run 40tph using block signalling for ages. It’s not just interlining – if you have some branching outside the core it’s usually manageable. But there are numerous subway routes which share track with as many as 3 other routes over their length. When you have that many merges conflicts are bound to arise and capacity suffers. To stay on topic though, open gangways are really a no-brainer. There’s nothing to say really. They’ve been run in service here for decades. Eh, the fact that the NYC subway can only run 24 trains per hour on a lot of the track doesn’t have much to do with the fact that Toronto has better headways on its subway on a Sunday evening than we get in the City That Never Sleeps. Toronto’s TTC just provides better service than the MTA thinks is necessary. So does Chicago, who I think runs 8-12tph on weekends on the heavier-utilized Red, Brown, and Blue lines. Even their 6-7 min headways during weekend days is a dramatic improvement over the 10-12 minutes of the MTA. Interlining is related here, but not as a capacity limiter when we’re talking about off-peak. Interlining allows an “acceptable” frequency to be achieved in Manhattan, while unacceptable frequency is then forced on outlying segments. If you need 18 tph on a certain trunk line, you can achieve that with 10 tph split across 2 different express lines, and 8 tph on the local. But if that was only a single line, you’d need 18 trains going to all the same places. Except it is incredibly wasteful. For some reason, Toronto believes that any subway line must have less than 5 minutes at all times (except overnight, when the subway closes and for the most part replaced by buses) even on Sunday evenings when the train is very empty. I definitely have been on the Sheppard Line before when I was the only person on the entire train aside from the Operator and the Conductor. They could definitely use that money to improve their surface operations instead. London interlines and is upgrading signals to allow 33 tph on the busiest lines. The RER, which heavily interlines as well, has 30 tph on the RER A (with CBTC), and 32 in the two-track stationless tunnel between two four-track stations on the RER B+D. The Vancouver SkyTrain runs 33 tph peak today, with interlining, and could in principle run 48 tph, as could several other modern driverless systems that do not branch. In New York, the limiting factor to capacity is not the interlining. It’s dwell times at Grand Central. Otherwise the 4/5 could run 30 tph between them. On the SSR, where there is interlining, London can manage no more than 33tph. The Central and Victoria lines, both self-contained, manage 36. That’s not even mentioning Moscow, which runs 40tph+ with ease. The constraint on the IRT is Rogers Junction in Brooklyn. It’s almost comically inefficient that the 2, 3, and 5 have to share track. The gap fillers at 14th don’t help matters. It is unlikely that 42nd is THE problem: when the 2 runs via Lex during the rush there are not the kind of extensive delays that one would otherwise expect. Here is a picture I took of the open gangways in Toronto, last summer. I think this is more an issue of how the MTA (and other agencies) go about procuring equipment. I think it is definitely true that they’re between a rock and a hard place in that they can’t get off-the-shelf rolling stock due to the block-system (and need to “prepare” for pending CBTC implementation). However, it remains a mystery whether they just use the types of rolling stock they use because it’s the most compatible, the cheapest, or because they think nothing else could [be modified to] work. I’d also be curious to see that data adjusted with the last significant addition to rolling stock…I’d hazard a guess that most of the American agencies mentioned update their equipment much more slowly, which might also affect any decision on significant changes. New-York-City-subway-car is one of the most common subway cars in the world. Minor changes results in Chicago L car or PATH car or Washington Metro car. It’s one of the most off the shelf things out there. Not sure what the block system has to do with anything. Signaling is just a matter of putting an extra computer into the train. And yes, as adirondack noted, NYC subway cars are basically the same as cars around the country. Hell, Metrovagonmash in Eastern Europe makes cars that are basically modernized versions of our older fleet. The legacy signal system is installed in the operator. He or she uses their eyeballs to look at the colored lights by the side of the track. Yes, obviously a block signal system does not require equipment other than a tripcock. CBTC and its friends obviously do. My bad on the wording. Train the operators to look at the colored lights and when they are on track that uses the colored lights shut the computer off. I was under the impression that they’ve been attempting to future proof some cars by enabling them to work with both the block system and a CBTC system, in the future. In any case, the second point you raised is kind of what I’m getting at: what is it about the particular design that continues to make it attractive, when the designs/standards have shifted greatly over time? My main question is whether there’s a trade-off. If you have some budget and can only afford to make so many customizations, what gets prioritized and what doesn’t? Look at the “Toronto Rocket” for inspiration. When you run up a $32 billion debt you know that a future of deferred maintenance is more than an hypothetical possibility. So is the need to take failed train cars out of service. For a train with open gangways, that means taking entire trainsets out of service when one car fails. And if there is enough of that, there is a collapse in service. You’ve got to think new dark ages here. If it hasn’t already arrived, that just means Generation Greed can take more before it does. The newer subway trains are composed of two sets of 4 cars or two sets 5 cars. Have been for a long time. I’m aware of that. But you still only have to take half out of service at a time. I’m not in the mood to wandering subchat.com. They probably just take the whole train out unless it’s something that needs a long time to fix. It costs money to split trains apart and put them back together again. If you trash the union rule that says you need a certain job description paid a certain rate to uncouple ONE coupling, then yes it costs money. Otherwise it could be done for $10, including tax, tip and extra ketchup. No it doesn’t. The in service half needs to mated up with another in service half. By the time it gets switched around the yard the other half will be almost done with it’s repairs. Guys, I don’t understand the point of this argument. Currently we have two five-car sets in a train. With open gangways we will have two five-car sets in a train, due to the need for full cabs for CRs, assuming the system doesn’t go OPTO by then. What’s the difference? Well, if you need to immediately couple the cut-off half to another good half then my point isn’t valid, granted. If it’s gonna sit in the yard why did it need to be uncoupled? It’s not that. It’s that this probably almost never comes up. It doesn’t even make sense to move married sets around unless you absolutely must; better to just know where they are for documentation’s sake. If you are doing normal maintenance, you just schedule all sets of coupled cars to do the disruptive yard marshaling process together. Unexpected stuff that is really minor, like a cracked wheel, probably is fixed faster than it takes to uncouple and send half the train back into haphazard service. That leaves emergencies, and even then the loss of a single train is probably incidental to keeping up with service demands – with the possible exception of peak hour service demands. How hard is it to split the two halves? I know on other systems there are auto-couplers at the ends – not sure if that’s the case here. A much easier fix to relieve crowding on the 4/5/6 line, rather than replacing hundreds of relatively new trains (R142/R142A) prematurely, would be to add some service – at least on the 6. There was about an 8 minute wait for an uptown 6 train at 59th St yesterday around 8:30 am. Predictably, almost no one who was waiting was able to board. The line is capable of 2-3 minute headways, but these 6-8 minute waits have become standard during the morning rush. Also, if you want to change the cars used, let’s get those old R62/A trains, and their narrow doorways and constant door problems, the hell off the 6 line. Whose bright idea was it to return those older trains to the 6? I don’t have stats, but delays seem to have increased quite a lot since those ’80s relics replaced half or more of the R142As. Let’s try the easy solutions before we go for the difficult and most expensive ones — which we very well might need anyway. The capacity of the number 6 was cut after 9/11 by a policy of making certain that everyone was out of the train before it went through the loop — and under City Hall. Giuliani was worried about someone carrying a bomb powerful enough to pierce the train car, tunnel roof, and basement floor onto a subway train and setting it off. The stall at Chambers backs up the whole line, reducing capacity. Surprisingly, no one thought of shutting down the FDR drive, which passes not far from the basement of Gracie Mansion. That’s not the policy anymore though. You can stay on. The announcement at the end of the line is “This is the last downtown stop on this train. The next stop on this train will be Brooklyn Bridge City Hall on the uptown platform.” There’s nothing there that says that everyone must leave the train as are the last stop announcements on other lines, and there’s nobody walking the length of the train to make sure everybody got off. The R62s are coming from the 7 as R142s are converted to CBTC equipped R188s. The R62(A)s are due to be replaced in the 2020-2024 and 2025-2029 capital plans, and CBTC is supposed to be operational on the flushing line in 2016, so they’re dumped on the other IRT lines for a few years. The MTA has mentioned future subway cars incorporating open gangways. The R142(A)s won’t be retired to introduce open gangways anytime soon, but the R62(A)s might. 2) The old SMEE had HVAC retrofit installations and rebuilds during the 1980’s. Couldn’t the NTT (R142, r143, R160, R179, R188) get enclosed gangways as part of their midlife refresh? The A/C installations were during GOHs, which were basically overhauls-because-there-had-been-no-maintenance-for-20-years. We’re not at that phase yet. Furthermore, open gangways might affect structural components of the car, which makes it more complicated. Enclose in the accordion style maybe, but there’s not much benefit to that besides safely moving between cars. Open gangways seemingly would require an extreme retrofit to an existing car, basically cutting the whole end off. We’re a decade away from midlife for the R142 and R143, so its time to start considering mid life upgrades. The R44 & R46 got LCD signage and R44 got full width cabs. There are also a range of options for converting the existing NTT non cab ends. At the most extreme is something that will get the result you see in the Paris Metro picture above. However, that isn’t optimal, as that option practically eliminates the ability for emergency responders to reach under a train through the space between cars. The practical solution I’m suggesting is a partial door removal, with an enclosure. It would get enough room for 5-6 standees in the retrofit vestibule spanning the now used space between 2 cars. This sounds like a great thing to consider for future rolling stock. For the present stock, removing at least half the seating plus thoughtful pole placement would do a world of good. What if all seats were along the walls, like IRT cars? What if center poles were aligned off-center, as they used to be, sending the message that one side is wide enough for passing, but not for standing? It’s the culture of no that’s killing this country. If it hasn’t been done, it can’t be done, and there are always a million excuses as to why it would NEVER work. What’s sad is as long as the justification sounds reasonable, people nod their heads and parrot it as if thats the end all to the conversation. Wow, what an excellent point! The system IS in fact old, so the statement must be correct! Incidentally, what is the reason that the MTA has not adopted the “big red” concept from the MBTA, where the two center cars of rush hour trains have no seats? Chicago had tested this a few years back as well. This would NEVER go over well in New York, because it would result in fewer seats. Since getting seats pretty much is only possible for those in the far outer boroughs, you’d have outer borough politicians screaming about how working class New Yorkers, who already have hard enough lives, are being further inconvenienced so that more Manhattanites and trendy gentrifiers can fit on trains. $20 says this would be the exact argument. MTA tried this. I don’t remember that being the complaint. Worried about bad press when it’s accompanied by service cuts and fare hikes? I still agree open gangways are the way to go and I’m tired of the Not Invented Here trope. Here is a theory: it is too big of a risk for the people higher up in the ranks of the agency. Think what would happen if someone ever got hurt within the articulated section? Those sections tend to have movable floors and rubber siding, so the chance of someone getting hurt, ending up all over the front pages of the newspapers and suing is just too much. Imagine after one such accident a “helicopter governor” ordering all such articulated sets out of service? At least now if someone falls in the gap between the cars they can say that it has always been that way. Our lawsuit happy exceptionalism at work …. We have had trains of this type in London for several years and I do not know of any such accident occurring. Yes the floor plate moves as a train turn but it is quite gentle – you’re not standing on a fast moving turntable. Yawn. You do realize every light rail system in the country has these articulation bends right? Hell, even the buses here have articulated sections. Even “it doesn’t work in NY because we haven’t done it in NY” doesn’t work. The MTA get sued all the time. This is nonsense, and the MTA already runs articulated BUSES with an open gangway in the middle, with pulling in and out, 90 degree turns, and rough roads. These buses run in the snow and have even been in crashes plenty of times, especially if you consider the tens of thousands in service nationwide on a huge number of transit agencies. CBTC on the L train is supposed to allow up to 26 trains per hour. I can guarantee you that these trains are never 3 minutes apart on any regular basis. Walk-thru trains won’t matter much if there are only 4 to 5 per hour. Open gangways are a supplement to, not a replacement for more frequent service. The issue with the L is reported to be a lack of electrical substations to allow more frequent service. Once that is fixed, the constraint will be 8 Av terminal. After that is fixed*, 30tph+ should be simple. *Switches can be added to let some trains relay west of 6 Av. Do they even need CBTC to run trains every 3 minutes? It seems like they spent an incredible amount of money upgrading to CBTC for basically no reason besides the countdown clocks. Not normally, but the L has big constraints coming from 8th Avenue’s lack of tail tracks. If/when the substation issue gets solved, the 8 Av problem can be easily mitigated by adding switches to allow some westbound trains to drop out at 6th Av and relay on the third track. Is there any rule/law that requires trains to be emptied before being taken into a siding? Otherwise the cure may be worse than the problem. The system is up for modernization/replacement no matter what. I doubt the maintenance costs of maintaining old wayside signals is worth bearing any longer than necessary. Until service improves, require the state legislators to ride between the cars. They may have Harry Reid’s left over exercise bands to use as grips. Further, Prince Andrew may ride on one end. He gets to hold on via suction cups, which symbolize the vacuity of his mind. Finally, require MTA bureaucrats and union officials to compete for between car space; winners stand between the doors, losers between the windows. There’s still 8-12″ clearance around turns, right? Very shortly after this behavior modification begins, expect open gangways, shorter headways and whatever else the public needs to be expediently implemented. So the first thing I thought about it was how would one avoid the stinking homeless person smell when you can’t escape to another car? Long story short there’s enough grounds for kicking them out. Ya, obviously no good political solution on how to deal with the street homeless in this city. At the end of the day, since street homeless can’t be forced into shelters they are going to be in the subways, especially when it’s cold. Anyway, quick story from yesterday at the Astoria Ditmars Blvd station N/Q – A train went out of service and 3 MTA workers went through all the cars making sure everybody was off the train. A homeless guy was sleeping in the corner and he refused to move for about 3 or 4 minutes. Meanwhile all the MTA guys are pleading to him to get off the train because it’s going to the yard. Finally they tell him another train is coming across the platform and the homeless guy drags himself across the platform and moves to the new train. Kicking them out is easier said than done, especially if there aren’t any cops around. Obviously the city needs some sort of solution to the homelessness issue. The number of people living on the street has been growing over the last several years. However, the MTA should not be solving the city’s social problems. Homeless individuals take up several seats, if not a full car by virtue of their odor. If the existing rules were enforced then they would find other places to reside. Open gangways would make it that much easier to escape. Right now you’re trapped, especially if a smelly person gets on at Canal and you can’t get out until DeKalb. Best place to try this out is the S Grand Central Shuttle. It has capacity limitations, people walking through cars (when they can! ), and MTA need only buy 10 cars to start. Frankly, the shuttle should be automated by now. I cannot imagine the tedium of driving the same exact route dozens of times a day. It was even automated in the 60s. The SIXTIES!! Why not today? Another cheap way to bring back capacity? Bring back the straps for riders to hang onto. One reason that riders on the R46 and other cars don’t move to the middle of the car is that they wouldn’t be able to reach a pole or the overhead bar. The removal of straps created such a design flaw I am amazed its not discussed more. THANK YOU! I say this all the time- it’s not a problem of people being to stupid to move to the middle, it’s almost always one or two short people blocking access to the middle by staying on the pole next to the entrance, because if the middle pole isn’t accessible they have nothing to hold onto. A glaring design flaw and so easily fixed. I’m glad someone else brought up smells. Please. Never institute open gangways in NYC. Individualized train cars are a life saver. It is wishful thinking to enforce the rules. You would have exponentially more delays in service trying to get unruly passengers off, as well as probably more violence due to drunks or creeps. Sometimes you just need to go to the next car for your own safety or sanity.